So, what causes narrowed airways ? The most common reasons for snoring is obesity. This fat, which bulks up their throat tissue, partially blocks their breathing while they sleep, causing their airway to collapse a little and a loud snoring noise to be produced. Smoking causes the mucous membranes of your nose and the tissues of the throat to swell up. This creates the airway obstruction leading to loud snoring noises. Drinking alcohol causes your muscles to relax more than they would during normal, sober sleep. This will in turn cause your throat muscles to be more loose or relax and hence vibrate when air passes through the nasal airways. Mouth breathing; For breathing at rest, it is ideal to breathe through the nose. People with nasal airway obstruction who must breathe through their mouths are therefore sometimes called “mouth breathers.” In adults, the most common causes of mouth breathing are nasal obstruction like septal deviations from a broken nose or tissue swelling from allergies and sinus infections . 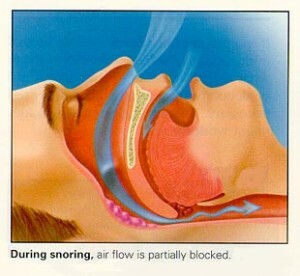 Many mouth breathers snore, because the flow of air through the mouth causes greater vibration of tissues. In children, enlarged tonsils due to an infection are often the cause of the airway obstruction. The soft palate is part of the palate in the mouth. It is a soft flap of tissue that hangs down in the back of the mouth. If it is too long or floppy, it can vibrate and cause snoring. The uvula is suspended from the center and back of the soft palate. An abnormally long or thick uvula also can contribute to snoring. If the back of the tongue is large or if the tongue is able to slip backwards, it can narrow the space through which air flows in the pharynx, which can lead to vibrations and snoring. Sleeping position and snoring; When we are asleep, we lie on our backs and gravity pulls the palate, tonsils, and tongue backwards. This often narrows the airway enough to cause turbulence in airflow, tissue vibration, and snoring. First of all, it is absolutely necessary to rule out obstructive sleep apnea or other sleep disorders before looking for any snoring cures. Sleep apnea is a disorder whereby an individual can stop breathing for several seconds or even up to about 1 minute. This condition, in rare cases, can be life threatening. However certain sleep apnea symptoms can be easily recognized if a person is monitored by another individual. These are the following sleep apnea symptoms; loud snoring, gasping, and suspend the breath for several seconds. If you have these symptoms, then go hospital to see a doctor and take effective measures. Once sleep apnea is ruled out , these following stop snoring tips can be followed to stop snoring at night naturally. Stop any mouth breathing habits; try to consciously start breathing with your nose. The best stop snoring remedy can be your sleeping partner. Frequently, if the snorer is gently reminded by their sleeping partner to roll onto his or her side, the tissues are no longer pulled backwards and the snoring lessens. Start losing some weight and you will not need any other stop snoring products. There is an instant stop snoring cure , quit smoking it as soon as possible. The smoke contains irritants that constrict your breathing passage. If you have the habit to drink before sleep, quit drinking or do not drink 2 or 3 hours before bedtime. Another natural device that stop snoring is a humidifier. The steam from the humidifier soothes the throat by decreasing the amount of congestion and ultimately stops snoring. Which device is it? I could not find any in the rest of the article.. I came across your site when this site is very help full. ,I’m very interested in this story. Thanks for this information. I have visited many sites in my research of this problem and have found yours to most informative. Can anyone suggest any further resources that I could check out? Keep up the good work.